Company Culture - About US - SOLARCUPID ENERGY CO., LTD.
SOLARCUPID ENERGY CO., LTD. was established in January 2006, mainly specializes in R&D, production and sales of LED lighting, DC energy saver, solar lighting, solar PV modules, solar system, solar electric products and providing solutions for varieties of renewable energy products projects. 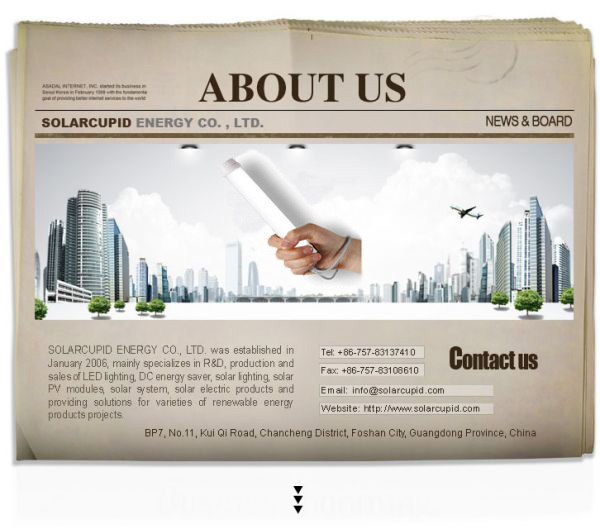 With a strong R&D team, quality control, competitive price, best service and faster lead time, SOLARCUPID enables customers' energy saving, highly efficient, long lifespan and environment friendly benefits. Our factory was taken up 20000 Square Meters, we have 400 employees to service for our current factory. We also build a good business accossiation with many brother companies, we can try our best to meet any difference requirements from the clients. We here warmly welcome our customers come to visit our factory located in Foshan, China. In order to enter into a low carbon living together with all the customers and make a more clean earth immediately, SOLARCUPID has already developed some new design solar products to promote the renewable energy application. Pay less and rapidly enter into the low carbon world, SOLARCUPID is your better choice! SOLARCUPID offers a comprehensive OEM service package including consulting, customerlize design, individual planning design and engineering, cost analysis, delivery terms prognostics, manufacturing, and warranty. In addition, SOLARCUPID provides technical support on project installation and system operation to create specified renewable energy products effects for its customers throughout the world. SOLARCUPID ENERGY CO. , LTD.